When studying a subject one should be able to detect the distortions present in the knowledge being received. This is especially true when one is dealing with the fundamentals of a subject. The distortions can be very pervasive. They may even enter the definitions of words in a dictionary. The following procedure helps one detect and clear any distortions present in the subject being studied. List the key words, or concepts, of the subject. Look at the subject mindfully starting with its concepts expressed as key words. List the key words on a worksheet as you go through the subject. This list may grow as you get deeper into the subject. For example, you may find the key words in the subject of mathematics to be: mathematics, arithmetic, algebra, geometry, number, addition, subtraction, multiplication, division, equation, unknown, variable, space, direction, distance, position, etc. NOTE: You may use an Excel Worksheet to list the words and concepts. 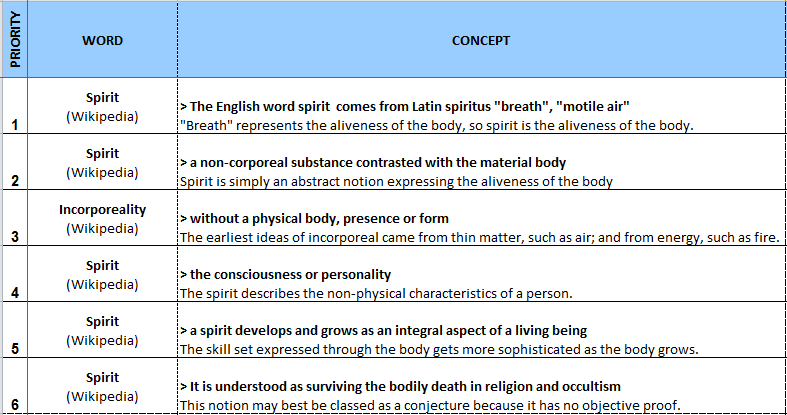 In the example shown below, the worksheet contains concepts associated with the word SPIRIT. There happens to be more than one concept associated with this word. The sequence of these concepts is maintained by assigning “priorities” to them. ‘Word clear’ the key words and concepts as you proceed. The purpose of study is not to memorize information, but to resolve the inconsistencies or blanks in understanding. ‘Word clear’ the key words as you proceed. Study the materials one paragraph at a time. Summarize and reduce each paragraph to its main thought before proceeding to the next. If the paragraph is difficult to reduce to its main thought then look for words in that paragraph that may not have been understood fully. These could be simple words. ‘Word clear’ such words. If the difficulty with a paragraph still persists then note down the confusion on your worksheet, and proceed to the next paragraph. Arrange the key words, or concepts, in proper sequence. The key words should be listed starting with those that express the fundamental concepts followed by those, which are derived from earlier concepts. Start by arranging the key words, or concepts, in the sequence that they appear in the material. As you gain familiarity, rearrange by words/concepts as they seem to have evolved. Move the words embodying more fundamental concepts toward the top. Move the words embodying derived concepts toward the bottom. Note the inconsistencies among the concepts. As the study of the subject progresses and better understanding comes about, the list of key words may be continually rearranged to achieve a consistency among the concepts. If you notice any inconsistencies, note them down on the worksheet. This then motivates a research deeper into the subject. Clarify the fundamentals of the subject as a priority. The consistency among the fundamental concepts in a subject is very important because it affects the consistency of the later concepts. Look closely at the inconsistencies starting from the top. 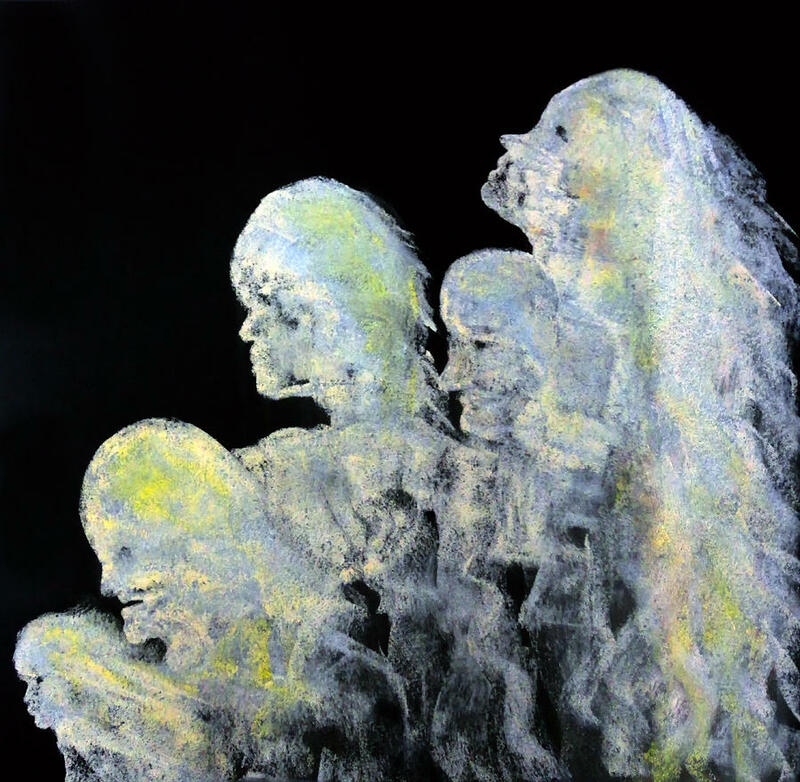 Are there underlying assumptions? If so then this may reveal gaps in the subject itself. There are likely to be many contributors to a subject. For example, many different cultures have contributed to the subject of religion. You may find similar concepts referred to by different words in different languages. Note down all those words and differences among the concepts. Make the subject as complete as possible. There are many examples in the subject of religion where gaps in knowledge are hidden under assumptions and dubious “explanations.” This may be the case with any subject where inconsistencies abound. When such assumptions and explanations are ferreted out, then the gaps in knowledge become obvious. Only when such gaps in knowledge stand out in the open and become uncomfortably clear that they can be addressed. Fill gaps in the subject with wider research. Make the subject as complete and consistent as possible through experimentation and direct experience. Thus, subject clearing can occur. This is an important paper which should be disseminated to anyone who wishes to master any subject. A version could be derived for teachers with children who are having difficulty in an area. Any system of any kind must be doable for for the particular individuals using it. Word/Subject Clearing is the key approach used in KHTK that utilizes mindful contemplation.